Courtesy of MOUNT VERNON CO.
A new boutique hotel called The Revolution will be opening just a block away from The Alise Boston (formerly The Chandler Inn) on Berkeley Street in the South End. 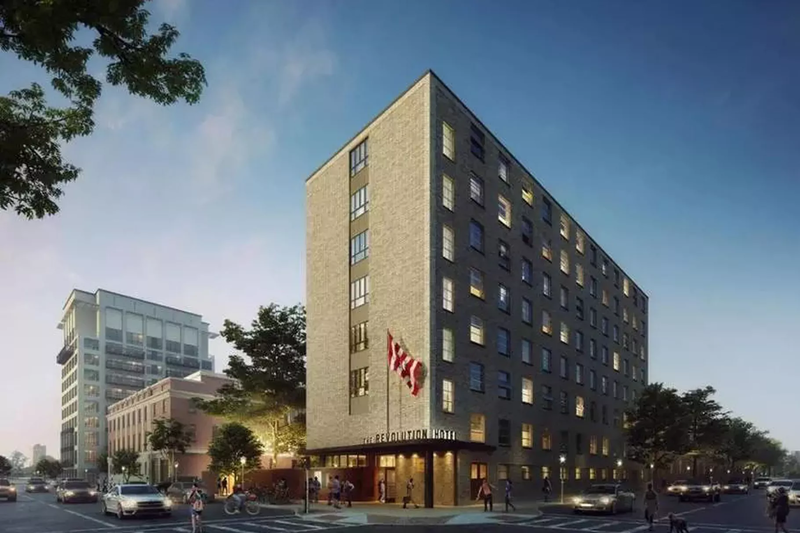 The local property company, Mount Vernon Company, announced they will turn the home of the former YWCA property at 40 Berkeley Street into a 164-room boutique hotel, which will be managed by Provenance Hotels. The Mount Vernon Company initially purchased the property in 2014 but left it alone until construction started earlier this spring. The interior will be decorated with paintings by Boston artists, overlaid with the titles of songs by Boston music legends such as Aerosmith and Donna Summer. The hotel will offer studio suites for business travelers, as well as triple and quad rooms with shared bathrooms for larger groups. “Premium King” accommodations will also be available with ensuite bathrooms with rooms starting at approximately $150 a night. The property’s large courtyard is being redesigned to house an indoor-outdoor restaurant with the basement converted into a bar that will double as co-working space during the day. Stay tuned for more details. This entry was posted in Boston, South End and tagged BosGuy, Boston Guy, South End. Bookmark the permalink.